Next week (4-8 December 2017) is our College Awareness Week. The main focus of this week is to get our senior students thinking seriously about colleges/careers and different opportunities after they leave school. We have a broad range of speakers during the week, including representatives from colleges, access programmes and professionals working in many diverse areas, who have kindly agreed to come to the school to talk to our pupils. I would be delighted if any parents/guardians who happen to be free would come and enjoy some of our talks. All our talks will take place in the library. Please see attached the timetable of events for the week. Any events which have been added, or any events where there has been a time change appear in red. Please check in with your son/daughter during the week to see if any additional events have been added. Barrister, Law Society of Ireland. Nationwide, working in radio and TV. Ann Mc Loughlin, ESB Apprenticeships. Head of Education, Mountjoy prison. Civil Engineer (Dublin City Council. Accounting Technician Ireland, working and studying at the same time. Joe O Sullivan, Dublin Institute of Technology. Blackrock College of Further Ed. Welcome back to another school year. Congratulations to all our Leaving Certificate and Leaving Certificate Applied students who received their results in August. Our students have progressed to Third Level University Courses, Institute of Technology Courses, Post Leaving Certificate Courses, college access courses, apprenticeships and jobs. Good luck to all our past pupils on their individual journeys. Important dates for your diary regarding Higher Education Access Route and Disability Access Route. HEAR is the Higher Education Access Route-an admissions route for school leavers who, for social, financial or cultural reasons, are under-represented in third leve education. DARE is the Disability Access Route. It offers college places on reduced points to school leavers, under 23 years of age, with a disabililty. Information regarding grants/scholarships and bursaries available to students. Give information to parents/guardians on all other issues relating to applying to college, grants, access programmes, subject choice, testing in school, information nights and any other relevant information which may arise in relation to guidance. Roselyn Park College, Info sessions every Wednesday. College of Amentiy Horticulture, Botanic Gardens. Open day. Students must have the permission of their year head if they wish to visit a college during school time. If an open day is on at the weekend it is recommended that students attend on that day. A listing of career events and open days are displayed on the library window. Students are also informed of these events in guidance classes. All career events are listed on www.qualifax.ie . Students; with the permission of their parent/guardian, year head or principal, are encouraged to attend these events. If an event occurs at the weekend students are expected to attend at the weekend unless there are extenuating circumstances. Students are encouraged to do research prior to attending an event so that he/she may be prepared and get the most from the event. Wednesday November 22 (10am-13.00pm), the Auditodrium Block A, DCU, St. Patrick’s Campus. Please remember that everything that is mentioned in this newsletter is covered in detail in senior guidance classes. Senior students will have all this information in their guidance folders. Please make a point of checking the folder to reinforce the key dates and events. While our College Awareness Week may seem quite a distance away it is already in the planning process. During this week we will accommodate a large number of speakers from a wide range of colleges/career areas. All our 5th and 6th year students are encouraged to attend talks which may be relevant to them. This is a great opportunity for students to hear what it is really like to work in a particular area. Parents are also encouraged to attend talks in the school library. The timetable of events will be posted on the website closer to the time of the event. A large number of speakers visit the school during to deliver talks on various colleges, courses and career areas. All senior students, with the premission of their teachers, have access to these talks. EXCITING NEWS REGARDING NEW FUNDING/BURSARY SCHEME FOR LOWER INCOME FAMILIES. On August 23 2017 ministers announced €16.5m as part of a plan to widen access to Third Level Education over the next three years for students from disadvantaged backgrounds. The funding will be used to break down the barriers of disadvantage and open up pathways into education for those who may easily miss out. The bursary aims to support over 2,000 extra students from disadvantaged groups to participate in third level education. Entrants from under-represented socio economic groups and communities. Members of the Irish Traveller community. Socio economically disadvantaged lone parents and ethnic minorities. I will keep all students informed of application procedures for these grants and all other grants/scholarships/access programmes etc. Students will always be informed of all key application dates during guidance classes and at the appropriate time. Students will be given handouts with these dates. Students and parent/guardians must take responsibility for checking the guidance folders and remembering these dates. Interested students should consult the notice on the Library window concerning ESB apprenticeships in the areas of Electrical and Heavy Goods Vehicles. There will be a career information night next Wednesday 1 February at 7pm. The time has now arrived for sixth years to make decisions regarding their plans for next year. This is a daunting task for many sixth years especially as is accompanied by high academic demands this year. While students are supported and assisted every step of the way this encouragement must be accompanied by a large amount of self-directed research and investigation. The student must take on the responsibility of researching his/her possible choices. This will see the student engaging fully in the investigation process and will help him/her to make as informed decision as possible. A large number of speakers visit the school to deliver talks on various colleges, courses and career areas. All senior students, with the permission of their teachers, have access to these talks. It is important that students attend the talks and ask as many questions as possible. All listings of career events and open days are displayed on the library window. Students are also informed of these events in guidance classes. All career events are also listed on www.qualifax.ie. Students; with the permission of parent/guardian, year - head or principal, are encouraged to attend these events. If the event occurs at the weekend the student will be expected to attend then unless there are extenuating circumstances. Students are encouraged to do some research prior to attending a career event so that he/she may ask relevant questions. v Change of mind facility. v What to do if you do not receive a place. Parents/guardians will also find all this information on www.cao.ie. 1 March 2017-5.15pm-closing date for completion of HEAR/DARE forms. 5 May-1 July 2017-free change of mind facility open. The Higher Education Access Route( Hear) is an admissions route for school leavers who for social, financial or cultural reasons are under-represented at third level education. AM I ELIGIBLE TO APPLY FOR HEAR? 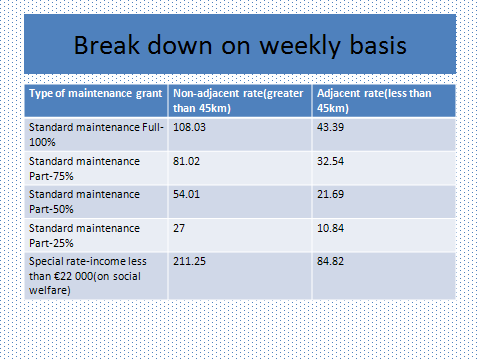 v Socio-economic group underrepresented at third level. v You live in an area of concentrated disadvantage. You must meet the income limit and the right combination of two other indicators. WHAT SUPPORTS WILL I GET? You must indicate on your CAO form that you wish to be considered for HEAR. WHAT DOCUMENTS DO I NEED TO SUPPLY TO THE CAO IF I AM APPLYING TO HEAR? Social welfare form signed and stamped by local Social Welfare Office (download from CAO website). RP50 notice of redundancy or retirement lump sum payment. Letter from TUSLA for children in care (download from CAO website). 1 March-Complete all elements of the HEAR application form. Gather all supporting documents (You should apply to revenue for your P21 now). 1 April-Submit copies of documents to the CAO. Keep original documents and get a certificate of postage from An Post every time you post something. Late June- Applicants notified of outcome of HEAR applications. Late August/Early September-Mandatory HEAR orientation programme. This is a supplementary admissions scheme which offers college places to students with disabilities. Anyone whose disability has had a significant impact on educational performance in school. Apply to the CAO by 1 February. Submit completed academic reference to CAO by 1 April (the school will organise this). Submit your evidence of disability documentation to the CAO by 1 April (consultant report). They are one year courses which may lead to a second year Higher National Diploma and are provided in schools and colleges outside the third level sector. They are held in colleges such as Bray institute of Higher Education (BIFE). WHAT DO I NEED TO APPLY FOR A POST LEAVING CERTIFICATE COURSE? Traditionally they are aimed at people with a pass Leaving Certificate or Leaving Certificate Applied. However this is changing and many courses now require people to have one or two honours. CAN I GO ON TO UNIVERSITY/INSTITUTE OF TECHNOLOGY AFTER I DO THE PLC? Usually students take 8 modules or subjects. They will usually need distinctions (80% or over) in 5 subjects to be eligible to attend an Irish university or Institute of Technology. Check with individual colleges as this may differ. HOW MUCH DOES A PLC COST? There is a student contribution of €200. You do not have to pay this if you have a medical card. There is a student resource fee of €350. Specific courses like Art or Beauty Therapy may incur higher costs. Some colleges allow students to stagger payment of fees. You are entitled to apply for a SUSI grant. STUDENT UNIVERSAL SUPPORT IRELAND (SUSI) GRANT. All students are entitled to have their fees paid under the free fees scheme they may still be entitled to pay a student contribution charge of €2750. This may be covered by your SUSI grant. 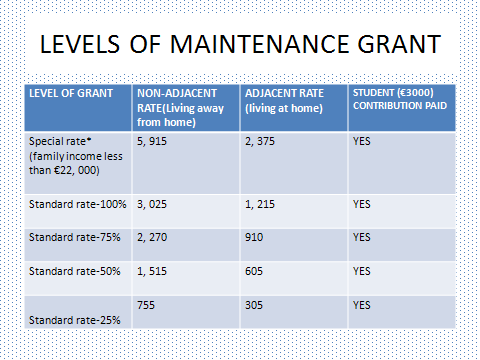 AM I ENTITLED TO A SUSI GRANT? 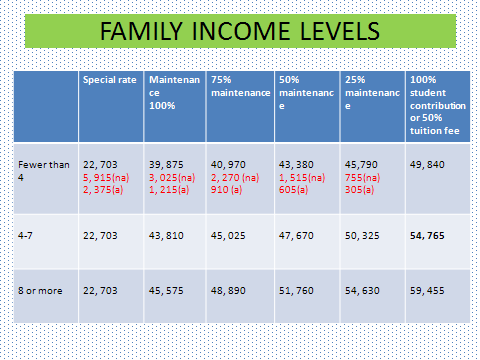 Please look carefully at the income levels the levels of maintenance grant and the family income levels below. This will give you a very clear idea if you are entitled to apply based on your family income. Remember the family income which is used to calculate grant eligibility is for 2016 while the income which is used for HEAR eligibility is for 2015. HOW DO I APPLY FOR THE SUSI GRANT? Log onto www.susi.ie at the beginning/middle of May. You will answer a list of questions related to your family income. SUSI will get back to you to let you know if you are eligible and will tell you what documents to forward. www.qualifax.ie- Career information/subject choice information. www.careersportal.ie Career information/subject choice information. www.revenue.ie Who to contact for your HEAR/SUSI grant financial documents. INFORMATION FOR PARENTS OF THIRD YEAR STUDENTS. This is just the start of the subject choice journey. I would be delighted if all parents/guardians would read this booklet with your son/daughter. There is a section for notes at the end of the book. Why not jot down any questions or concerns here and you can address these at the subject choice seminar for students and parents which will be held in the next two months. 5 March: Late applications opens at 12.00 noon. 1 March (5.15pm): Last day for filling in HEAR/DARE forms. 28 March: All financial documents must be uploaded to your application form. 28 March: Teacher references must arrive at Trinity. It is the student’s responsibility to give the reference forms to the relevant teachers. *You must also upload medical card/GP form by this date. 8 April: Closing date for DIT Completed Access application forms. Open Evening for anyone interested in Economics/Law/Finance. One in six chance of getting a scholarship. After application you will receive an interview date. You will need a CV and reference. Students who are eligible to apply for HEAR are also eligible to apply for this access programme. Students must have the minimum entry requirements for the course applied for. Documented evidence of long-term disability or serious medical condition. A high level of motivation on the part of the applicant. The minimum entry requirements for the course. The closing date for completed applications is Monday 1 February 2016 at 5pm. Late applications cannot be considered, proof of postage is advised. CAO Information and Advice Clinic will be taking place in UCD on Tuesday 12 January from 5-7pm. This workshop will provide advice to parents and students about the CAO application process. UCD Engineering and Structural Engineering with Architecture Open Evening will take place on Wednesday 13 January from 6-8.30pm. Log onto www.ucd.ie/opendays to register.